Warm weather is approaching and I am getting more and more excited for it. Summer means swimsuits, iced cold drinks, and lots of lovely warm rays of sunshine warming you up. With the warm sunshine also comes the need for lots and lots of sunscreen. Sunscreen and varied forms of SPF are a non negotiable for me. As a faired skin, faired haired individual, more than five minutes spent in the sun sans SPF and I will definitely be looking a little lobster red. For all others, sunscreen should be a necessity for you too to protect your from any form of the sun’s harmful rays. I put together a collection of my favorite sunscreens for all occasions that are sure to protect your skin wherever you’re headed this summer. For those who do a lot of traveling, your best bet is to get a TSA friendly collection of products. My two favorite sets for traveling are the Supergoop City & Sand Tote and the Coola Everyday Essentials Kit. Each of these little kits has everything you need to protect your face, body and even lips from the sun. The Supergoop kit has an amazing sunscreen serum that goes under your makeup and makes you skin feel super moisturized and protected from the sun. The Coola kit even has a little Radical Recovery After Sun lotion to help replenish your skin’s moisture after a day out and about in the hot sun. For those who need to reapply sunscreen on your face often, but don’t want to ruin your makeup, then definitely check out the PTR Instant Mineral Sunscreen. Light and translucent powders that come in SPF 30 or SPF 45 work as both a sunscreen and your own little powder compact, taking care of shine and the sun all in one! It’s a total holy grail for me when it comes to re-applying sunscreen over my makeup. For those looking to go a little more natural check out the Yes to Cucumbers Soothing Natural Sunscreen. It is made of 97% natural ingredients and is great for both face and body. For those galavanting off to super warm climates, grab a bottle of Neutrogena’s Fresh Cooling Sunscreen. I picked up this right before a sunny day at Disneyland and i’m not sure how they do it, but it felt like a cool mist of water all over, instantly cooling me down. I am totally going to pick up another bottle of this when I head to Palm Springs this weekend! For those that are a little more active or plan to spend their entire vacation jumping in and out of a pool, the SPF for you is Neutrogena Wet Skin Sunblock Spray. Formulated to be used on wet skin without dripping of, this sunscreen will give you the strongest protection in a snap. 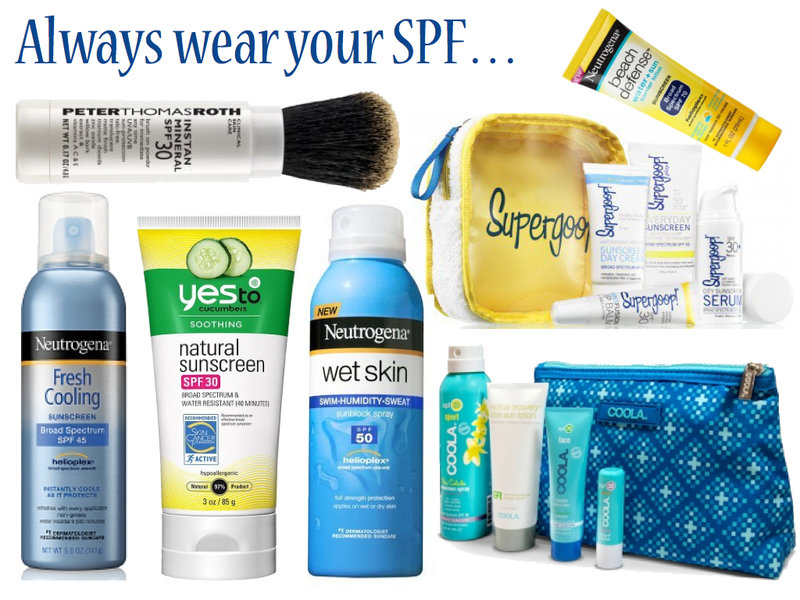 Got a favorite sunscreen? Share with me in the comments! What a great round-up of sunscreens. I've always been a fan of Neutrogena sunscreen, but I'll have to try some of these brands as well! I really like the Neutrogena Ultra Sheer sunscreens! My favorite sunscreens are by SolScents. They're like a scented lotion and sunscreen in one. And proceeds of their products go to charity, which is always a plus. The Peter Roth product looks amazing for summer! Thanks for sharing! I love to see and hear other people's ideas for make up and face products.